Here are some excellent printed publications that have more extensive information about the Big Sur region than I can provide in this small Web site. 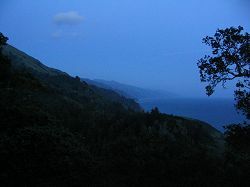 This book provides detailed information about hiking and backpacking the trails of the Big Sur region and the mountains east of the crest of the Santa Lucia range. This detailed topographical trail map includes the Big Sur coastline from Garrapata State Park to Ragged Point as well as the national forest interior. 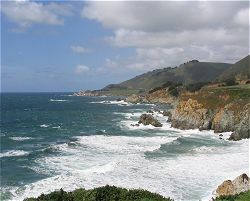 It also serves as a good road map for most of California Highway 1 in the Big Sur region. This book includes a variety of hikes to accommodate different recreation goals and hiking abilities. The description of each hike includes a map, directions, and a summary. This book describes the Big Sur region ... the parks, lore, history, and scenic riches ... emphasizing day-hikes both from the coast and interior roads but also including some backpacking routes, mainly in the Ventana Wilderness. This guide is an essential handbook for both new and seasoned visitors exploring California's majestic 1,100-mile shoreline. With up-to-date maps and information, it is a valuable guide for all beachgoers -- hikers, campers, swimmers, divers, wheelchair users, joggers, and boaters -- detailing where to go, how to get there, and what facilities and environment to expect. Includes the Big Sur region and as far south as Point Mugu. This book is a natural history of the Big Sur region but is also a guide to its extensive public lands. Included are an overview of the area's geology, climate, and native plants and animals, and more in-depth descriptions of selected sites, trails, and features. Tales of Nepenthe Restaurant and its role in Big Sur. Author Romney Steele is a writer, cook, and food stylist, and the granddaughter of Bill and Lolly Fassett, creators of Nepenthe Restaurant. Filmed in Big Sur, The Sandpiper portrays a boy and his free-spirited, unwed mother (Taylor) living an idyllic lifestyle in Big Sur. An Episcopalian priest (Burton) initially disapproves of the mother, but eventually they have an illicit affair. The film may have had a major role in luring many hippies to the Big Sur region during the mid- to late 1960s. Author Henry Miller arrived in Big Sur in 1944. 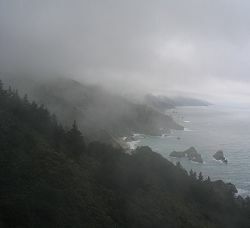 This is the story of Miller's life in the Big Sur region. This novel, a classic by Beat Generation author Jack Kerouac, is set in San Francisco and in Big Sur's fictional "Raton Canyon" (said to be modeled after Bixby Canyon) during the summer of 1960 and describes the author's own mental breakdown.